Solinftec, a leading digital ag company based in Brazil, to expand its innovative technology by providing American farmers with actionable insights, plans to invest $50.6 million to establish office at Purdue Research Park, create 90 jobs in 2019 and more than 300 by 2022. INDIANAPOLIS (Nov. 29, 2018) – Today, in conjunction with the AgriNovus Agbioscience Innovation Summit, Sao Paulo-based Solinftec announced plans to expand its operations to North America, establishing a new U.S. headquarters in West Lafayette, Indiana. With this growth, the digital agriculture company plans to create up to 334 new, high-wage jobs by 2022. 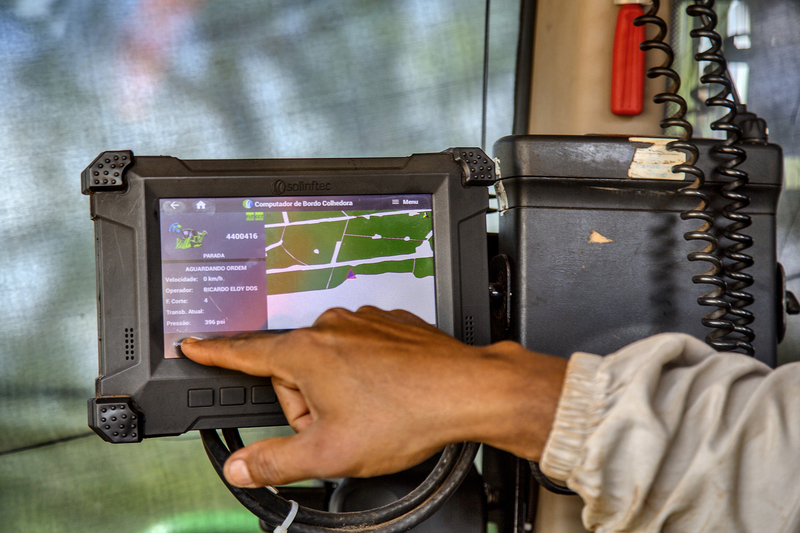 A farmer harvesting sugar cane touches an on-board computer screen created by Solinftec, a leading digital ag company based in Brazil. Solinftec connects machines and sensors to give farmers access to real-time information to help improve growing efficiency. A publication-quality photo is available here. Solinftec plans to establish operations at the Purdue Research Park in Tippecanoe County, investing in software and computer hardware to expand the company’s innovations to the U.S. and increase its tech-based offerings for U.S. customers in the agriculture industry. The company offers an IoT-based farm management system enabled by a suite of technologies, including proprietary hardware, a telemetry communications network and a software as a service (SaaS) platform, to support the increased efficiency of agricultural operations like planting, harvesting and spraying. The technology digitizes all aspects of agriculture operations, monitoring all processes and providing real-time actionable insights that increase crop returns. A farmer using a Solinftec Internet of Things platforms to harvest sugar cane. The company has created a smart ecosystem for integrated operations management to help farmers work more efficiently. Solinftec announced Thursday it is opening an office in the Purdue Research Park and expects to create more than 300 jobs by 2022. Image here. Founded in 2007, Solinftec, a leading digital ag company based in Brazil, to expand its innovative row crops technology by providing American farmers with actionable insights. Solinftec solution is present in more than 16 million acres, 20,000 ag machinery equipment, and its equipment is monitored in real time by more than 100,000 daily users. Solinftec is expanding its operations to America, establishing Tecsoil USA and a new U.S. headquarters in West Lafayette, Indiana.